The surge in government debt in many ways has been a transfer of debt from the individual to the public where many people controlling such matters feel it is more benign and abstract. 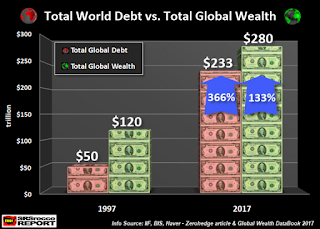 The focus of this final installment of three articles exploring how globally debt has become unsustainable and is poised to collapse in upon itself focuses on "debt to tangible wealth" and the relationship between the two. The chart to the right shows how debt has soared compared to total wealth over the decades, however, more important is what is revealed when we look closer at what exactly constitutes wealth and how much of it is tangible or real and not simply made up of a promise based on paper. These so-called paper promises include holdings in currencies, bonds, future income based on a pension payout, and much, much more. A place that displays how debt has exploded and gives credence that a storm is coming is a visit to the National Debt Clock. For those who have never experienced its enlightening and sometimes ugly secrets, this is a site well worth taking the time to study and explore. Especially intriguing are the much-underused features across the top that allow a viewer to move around in time as well as from country to country which gives a viewer a great deal of insight as to just how rapidly the debt of countries has grown during the last few decades. Born in 1928, Allen Meltzer, recently passed away but while little known by the masses he was viewed by many economists as America’s foremost expert in monetary policy. For over 25 years he was the chair of the Shadow Open Market Committee, a group that meets regularly to discuss the policy of the Federal Reserve. Meltzer was a professor of political economy at Carnegie Mellon University and a visiting fellow at Stanford University's Hoover Institution recognized for his wisdom and achievements in economics and the author of the three-volume “A History of the Federal Reserve.” Before his death his mood was troubled “We’re in the biggest mess we’ve been in since the 1930s,” he was quoted as saying but also his view of our path forward was also grim, “We’ve never had a more problematic future.” In 2013, I wrote an article about Meltzer and why he stated "It Will All End Badly" based on the idea that debt was being used as an economic crutch. This thought has been echoed many times by Peter Schiff a well known financial commentator. Schiff says printing money is to the economy what taking drugs is to a drug addict. In the short term it makes the economy feel good, but in the long run, it is much worse off. Schiff contends what was once the "long run" or "distant future" may be getting very near. Such warnings have been heard for decades, in his book "A Time For Action" written in 1980 William Simon, a former Secretary of the Treasury tells how he was "frightened and angry" sighting the growing national debt as a major problem and sounded the trumpet about how he saw that the country was heading down the wrong path. 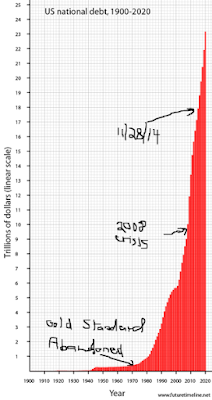 Back then it was about billions of dollars of debt, today it is about trillions of dollars. Looking back, it is hard to imagine how we have made it this long without addressing the concerns that Simon wrote about so many years ago. Had it not been for the sky-high interest rate environment ushered in by Fed chairman Paul Volcker at the start of 1980 that crushed inflation the story might have unfolded quite differently. The high interest rates acted as a reset of the global economic system that lasted for decades. That barrier to spending has now been brushed aside. By manipulating interest rates lower and expanding the money supply central banks have fostered an environment that has encouraged people to pursue riskier assets and investments while bringing forward future purchases. As interest rates rise, as they are, will, and must, the value of these risky investments will decline, and these investors will be hurt. Making things worse is the fact that interest payments on the public debt will rise increasing the already massive budget. This is already playing out in some sectors of the economy where prices have been rising rapidly and major distortions exist within the marketplace. 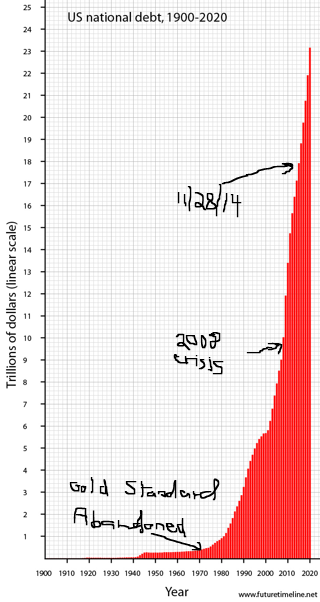 At some point collapsing debt and dropping faith in fiat currency will intersect creating an interesting place. History shows that when inflation begins to exceed the rate of interest paid, people start altering their buying habits which can create a self-driving feedback loop. I contend slow growth coupled with a lack of really good options as to where people can safely store their wealth will drive the value of real and tangible assets through the roof. During the next financial crisis we may not see a widespread domino effect in the banking system leading to contagion but massive losses in financial markets will result from defaults on debt. 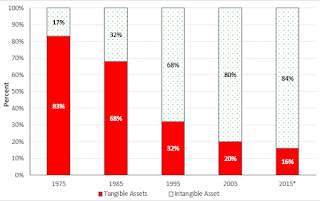 While it is difficult to predict the form a financial crisis will take a fall in the value of paper assets and global stagnation while the value of tangible assets rise in relative value will most likely result in a painful reality for many people. Footnote; Below are the links to part one and two of this series. Footnote #2; This post dovetails with many of my writings, for more on some of the subjects mentioned above see the articles below.